The gate agents were very surprised at my TG stock boarding pass. They told me that they would print me a "proper one". They were also very pleased to inform me that I would be "sitting in a very big seat that becomes a bed". My first impression of the cabin was one of space. Although there are 10 seats, just like on my TG flight, the cabin just seems to have loads of empty space everywhere. There was an absurd amount of space between my seat (1K) and the seat next to me (1A). Of course, this space comes at a cost. The seats themselves are by no means huge. They are perfectly comfortable for a short haul flight though, particularly for those lucky enough to fly them having paid for J. The cabin was completely full on this flight so I decided to hold off on taking a huge number of pics. Those are coming up on the return flight report! Moments after taking my seat the CSM came over to introduce herself. By introduce herself I mean, she knelt down next to me, addressed me by name and thanked me profusely for flying Asiana before handing me menus and asking me if there was anything else she could do for me. So yeah, OZ service? Pretty good. I glanced through the menu and decided on the beef. An FA came over to take everybody's food and drink orders before take off, thereby ensuring a speedy meal service as soon as the seatbelt signs went off. I was prepared for the fact that there isn't a huge amount of choice on OZ. As with the old seat though, given the length of the flight the detractors from the OZ experience weren't hugely pronounced. All 3 courses came out on a single tray. The salad was pretty standard. The bread tasted fresh and came out warm. The beef was excellent as was the rice. I only had a tiny bit of the dessert, I don't have a massive sweet tooth but thought it tasted pretty good. For this time of day it was appropriately light. To help me wash all of that down, I went for a glass of the Cabernet Sauvignon. I find that this grape variety tends to shine at altitude, where others can get a little washed out. After taking my empty tray away the FA asked if I would like any tea or coffee. I had noticed that there was an espresso machine on select flights and asked if I could get a decaf espresso. The FA was very apologetic and said that they only had decaf filter coffee. 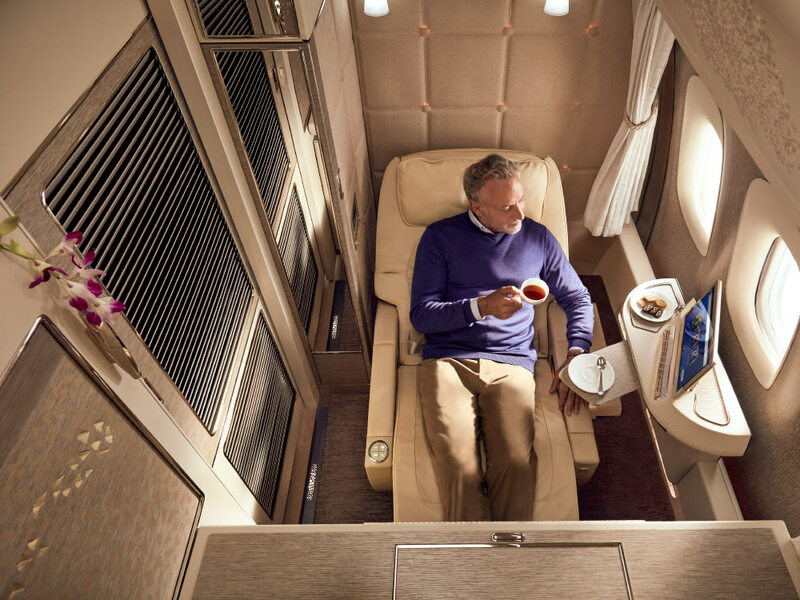 Here's where the Asiana service came into play, rather than leaving it at that and continuing on to the next pax in this full cabin, the FA proactively offered to make me a camomile tea so that I'd "be able to sleep better". Not only that, when she brought my tea she also smiled and handed me a bag of mixed nuts, "just in case you're still a bit hungry". At this stage I was beginning to see what all the Asiana fuss was about. Little did I know, things would only get more unbelievable. I got up to go to the bathroom and before I even got to the door I was greeted by two FA's. One of them stood back to allow the other to 'serve'. This FA was both extremely apologetic about the fact that the nearest lav was in use but also enormously happy to guide me to the one which was 5 yards away. "please sir, I'm so sorry but this one is free". Honestly, she had the biggest smile I've ever seen, coupled with extreme nodding and bowing. She seemed barely able to contain her excitement at having anticipated a customer's needs and having found a solution to a problem. I think I'll remember the look on her face until the day I die. She still wasn't done though. As I exited the bathroom, there she was waiting for me. As soon as she spotted me opening the bathroom door, she took a pair of tongs, picked up a steaming hot towelette and handed it to me. Part of me was thinking, "why the hell would I need a hot towelette after I've just washed and dried my hands in the past 15 seconds". The other part of me went, "this is a wanton indulgence which serves no real purpose other than to make me feel like I'm being taken care of. Plus this has got to be the 16th freaking moist, miniature towel I've been handed today. I could go for the record"! So yeah, the towel loving part of me won. The FA was overwhelmed with joy. There was no amenity kit provided but basics were laid out in the bathrooms and each of us was given a pair of grey slippers. I picked up a toothbrush (or two ) whilst I was in the bathroom. It has to be said the OZ toothbrushes are great. They are full size and have medium bristles (as opposed to the airplane standard, steel-like needles) and look pretty cool. In fact I'm still using one of these at the moment. All in all, I would rate the service as outrageous. The food was ok and the seat, for regional J was outstanding. In paid F on an intercontinental flight, I'd probably pick an airline with a better hard product based on this flight alone. However upon touching down, I was only a few hours away from my return flight in F, a great opportunity to compare the soft product between classes, whilst keeping the hard product constant.